Nestlé Crunch’s Girl Scout Candy Bars are back for a limited time this summer. To help draw additional interest in the bars, the brand is incorporating a cause marketing campaign called “Let’s Get Her to Camp”. 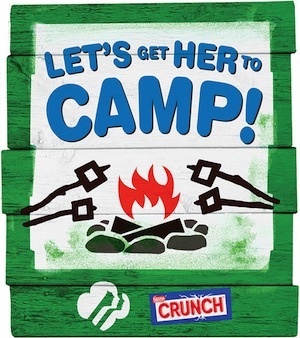 Nestlé Crunch will donate a minimum of $200,000 to fund Girl Scouts camp scholarships. Consumers can help increase the donation to $250,000 to send even more girls to camp by joining a virtual campfire and completing their own campfire story online. When this limited edition candy bar appeared on shelves for the first time, we wondered why there wasn’t a consumer-facing cause marketing campaign to go along with it. This summer, the partnership delivers precisely that. Camp and summer goes hand in hand, which makes this campaign easy for parents and kids to relate to and very timely. Providing a base scholarship amount and inviting consumers to add to the scholarship pool is also a smart move. Incorporating a daily product giveaway as well as a bi-weekly opportunity to win camping gear sweetens the incentive to participate. Asking consumers to conclude a camp fire story (vs. creating one of their own) also lowers the barrier to entry by providing content for people to respond to. The only thing missing from this campaign? Photos or video of real Girl Scouts themselves.